Origin and Habitat: South Africa, East London in the east to Port Elizabeth in the west and northwards to Adelaide and Committees on the Fish River. This species has practically the same distribution range as Haworthia cooperi. Habitat: It grows in a summer rainfall area and forms dense clumps hanging in crevices on rocky slopes of Witteberg quartzite along rivers and streams with southern aspect. Pl. Succ. Horto Alencon. 7; Haw. Syn. Pl. Succ. 93. Haworthia cymbiformis var. angustata Poelln. Haworthia bilineata var. gracilidelineata (Poelln.) Poelln. Haworthia cymbiformis f. pallida hort. Aloe planifolia (Haw.) Schult. & Schult.f. Haworthia cymbiformis f. subarmata Poelln. Haworthia planifolia f. agavoides W.Triebner & Poelln. Haworthia planifolia f. alta W.Triebner & Poelln. Haworthia planifolia f. calochlora W.Triebner & Poelln. Haworthia planifolia var. exulata Poelln. Haworthia planifolia var. incrassata Poelln. Haworthia planifolia var. longifolia Poelln. Haworthia planifolia f. olivacea W.Triebner & Poelln. Haworthia planifolia f. robusta W.Triebner & Poelln. Haworthia planifolia var. sublaevis Poelln. Haworthia umbraticola var. hilliana (Poelln.) Poelln. Haworthia planifolia var. setulifera Poelln. Haworthia cymbiformis var. obesa Poelln. Haworthia planifolia var. transiens Poelln. Haworthia cymbiformis var. brevifolia W.Triebner & Poelln. Haworthia cymbiformis var. translucens W.Triebner & Poelln. 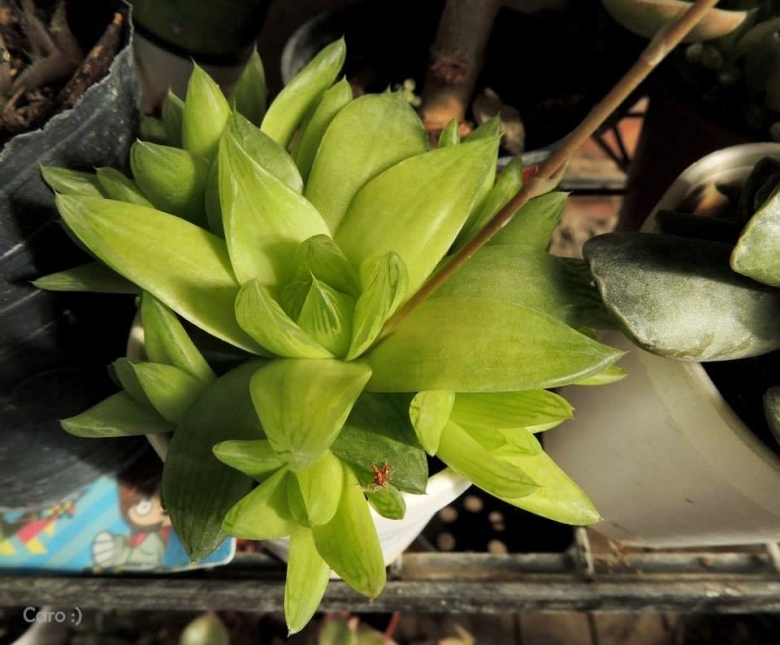 Description: Haworthia cymbiformis is a lovely dwarf species characterized by very plump and juicy leaves which are soft and swollen with stored water. It comes from a wide area, and a multitude of somewhat different looking forms are available under this name. It is very variable. Habit: It is a spreading ground cover succulent forming dense mats of very succulents and juicy leaf-rosettes partially sunken into the soil, and reaching a diameter of 15 (or more) centimetres. In habitat only the leaf tips, which has a finger-tip-like appearance, protrude from the soil surface. Stem: Stemless or shortly caulescent. Rosette: Stemless, dense, 20–25 leafed, 3-10 cm in diameter. Leaves: Succulent, soft, very juicy, obovate, boat-shaped, acute, 2-4(-5) cm long, up to 2 cm broad, 4-5 mm thick, upper surface slightly concave or sometime slightly convex, rounded on the back, prominently keeled upwards, not distinctly aristate (terminal bristle 1-5 mm long) , margin and keel smooth, sometime slightly serrated near the tips, green, bluish-green to greenish-grey, yellowish-green, turning yellow or orange red in full sun, marked especially in the upper half with indistinct anastomosing vertical achlorophyllous lines forming a translucent surface with ample irregular areas free of pigmentation known as windows (Some other genus such as Fenestraria also have transparent leaf tips). In the wild, the sun is very bright, and the plant grows mostly buried by sand with only these transparent tips above the ground. The greater part of the leaf, the cone mantle, is not exposed directly to the sun since the leaf is embedded into the soil, but receive the light incident on the windows transmitted trough the colourless water storage tissue to the assimilatory tissue located in the underground base of the leaf. Flowers: Relatively inconspicuous whitish/greenish with a light pinkish-brown keel, peduncle simple, 15 cm long; raceme lax, 15 long; lower pedicels 4-6 mm long; bracts small, ovate; perianth 2 cm long; segments nearly as long as the tube. Chromosome number: n = 7. Haworthia cuspidata Haw. : supposedly a cross between Haworthia retusa and Haworthia cymbiformis. Haworthia cymbiformis (Haw.) Duval: has very plump and juicy leaves which are swollen with stored water. It comes from a wide area, and is very variable. Distribution: East London to Port Elizabeth, and Adelaide and Committees on the Fish River. Haworthia cymbiformis f. gracilidelineata (Poelln.) Pilbeam: has small tightly clustered, rosettes up to 3 cm in diameter. Leaves incurved almost completely tranlucent. Haworthia cymbiformis var. incurvula (Poelln.) M.B.Bayer: has narrow, incurved leaves, with rounded tranlucent teeth. Distribution: Grahamstown , Eastern Cape, South Africa. Haworthia cymbiformis var. obtusa (Haw.) Baker: Distribution: Fort Beaufort, Eastern Cape, South Africa. Haworthia cymbiformis f. pallida hort. : Pale form with yellowhis-green leves. Origin: Plants so-named are known only in cultivation. Haworthia cymbiformis f. planifolia (Haw.) Pilbeam: always grows at an acute angle, often with the rosette almost perpendicular; it usually grows in shade but reddens if in the sun. Haworthia cymbiformis var. ramosa (G.G.Sm.) M.B.Bayer: it is a shortly caulescent form with smaller rosettes. Haworthia cymbiformis var. reddii (C.L.Scott) M.B.Bayer: Distribution: Fort Beaufort, ), Eastern Cape, South Africa. Haworthia cymbiformis var. transiens (Poelln.) M.B.Bayer: has translucent green leaves 1,5-2,5 cm long each with 8-10 longitudinal stripes. In ful sun the leaves tend to take a red brown colouring. Margin finely toothed. Distribution: Baviaanskloof and Langkloof , Eastern Cape. Haworthia cymbiformis var. umbraticola (Poelln.) M.B.Bayer: has leaf-tips with large clear areas with dark green lines. Haworthia cymbiformis f. variegata: has soft, juicy and glassy (almost transparent) leaves which are nicely variegated with light-green and white longitudinal strips with varying amounts of variegation. Haworthia planifolia f. agavoides W.Triebner & Poelln. : has large flattened rosettes with very wide leaves. Cultivation and Propagation: They are amongst the easiest Haworthias to grow. On account of their easy cultivation these plants are fairly common in collections and are more tolerant of injudicious watering than the others. They must be repotted frequently, because every year a part of their roots die and then rots in the pot. They are very responsive to differing cultural conditions both as regards colour, length and shape of leaves, rate of growth and size of plant. Watering Needs: Water regularly in the growing season, but avoid water-logging and let dry between watering, they should never dry out completely during the rest period. Frost Tolerance: Hardy to -1 (-5)°C. Propagation: Seeds or (usually) offsett. Sun Exposure: It prefers locations with diffuse sunlight or light shade, it can tolerate shade. It proliferates rapidly and should be exposed to at least some direct sunlight to prevent bloating and excessive softening of the plants, but shelter from direct sun during the hottest hours! Plants can have more remarkable colour under stress and if more exposed to direct sunlight.